Still Time to Vote for Locals Love Us Favorites! Look for the Locals Love Us ballot at 101HighlandLakes.com/BEST or in print in The Picayune. With the midterm elections behind us, it’s time to turn our attention to the annual Locals Love Us ballot, which you can find online at 101HighlandLakes.com/BEST or in the Nov. 14 edition of The Picayune on page 8. For the past several weeks, The Picayune readers and KBEY 103.9 FM Radio Picayune listeners have been casting ballots for their favorite businesses, organizations, people, and events. But the polls will soon close. This is the last edition of The Picayune in which we’ll run a ballot, and online voting at 101HighlandLakes.com/BEST ends Friday, Nov. 16. If you haven’t voted, now’s your chance. If you’ve already voted, you can do it again. In fact, you can vote once daily by online ballot. While politics can be serious business, Locals Love Us is a chance to have fun and celebrate Highland Lakes businesses, organizations, people, and events. Businesses and organizations can do a bit of lobbying on their own behalf by posting the voting link on their websites and sharing it across social media outlets. You can encourage, challenge, or just beg people to vote for you. Have fun with it. We at The Picayune and KBEY 103.9 FM Radio Picayune love the Highland Lakes and its natural beauty, but we know what really makes it special — what makes it the best place in the world to live — are its people, businesses, and organizations. 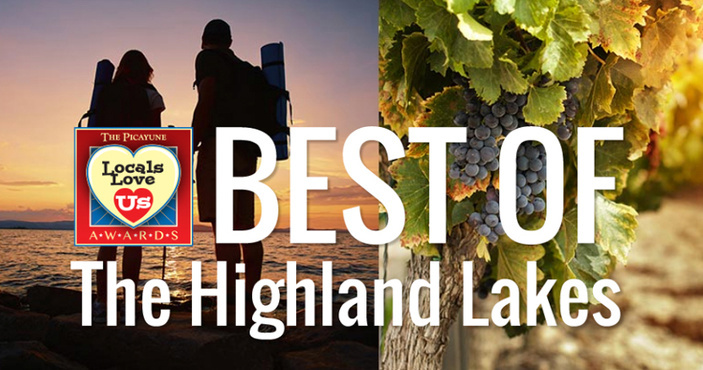 Locals Love Us is our way of helping celebrate the Highland Lakes.